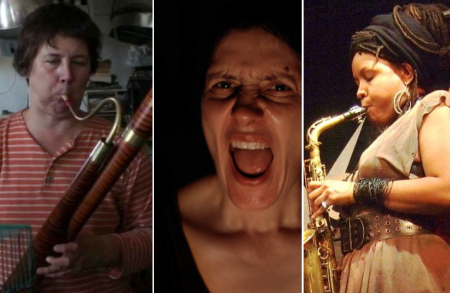 Welcome to the 31st Seattle Improvised Music Festival, taking place on Feb. 4, 5, and 6. This year’s festival takes a slightly different form. As usual, three visiting artists will join an array of local musicians; but with a couple of exceptions, the local improvisers will play multiple times during the weekend. These continued explorations throughout the weekend may expand the sonic worlds of the musicians and listeners. Additionally, there are no solo sets this year; each evening will open with a duo followed by two quartets. All fully improvised, of course. Carol Genetti is a vocalist, composer and installation artist who currently resides in Chicago. Her work is focused on the interplay between the voice as an expressive musical instrument and its extension into the sound-making realm. She has studied a variety of techniques including Western singing, Hindustani classical voice and Bulgarian folk music. Through these studies and her own explorations, she has developed a personal yet universal palette that is an abstraction of “extended” voice sounds — breaths, overtones, and disconnected textual bits, squeaks, growls, non-verbal tones — sounds that evoke unconscious emotions and human physicality. Genetti has toured throughout the US, Canada, France and Germany and has performed concerts as an improvisational vocalist with a number of like-minded artists. Matana Roberts is a sound experimentalist, alto saxophonist/clarinetist, composer, and improviser now based in New York City but previously from Chicago’s South Side, where she was an active member of the AACM and formed a trio, Sticks and Stones, with bassist Josh Abrams and drummer Chad Taylor, with whom she regularly performed at the Velvet Lounge. Roberts moved to New York in 2002, initially busking in subways and publishing a zine Fat Ragged, about her experiences. Roberts is the composer of Coin Coin, a multichapter musical work-in-progress exploring themes of history, memory and ancestry. The Jazz Journalists Association selected Roberts as a finalist nominee for the 2008 “Up and Coming Musician of the Year” award. In addition to the Seattle musicians, Los Angeles percussionist Alan Cook plays his first Seattle gig since his recent relocation to Longview, WA. Long active in the southern California creative music community, Alan brings a dynamic and multifaceted perspective to the exploration of the percussive arts. His 40 years of diverse musical experience includes performing with renowned musicians such as Dave Holland, Albert Mangelsdorf, Bobby Bradford, Fred Katz, Lee Konitz, Don Thompson, Ralph Alessi, Vinny Golia, Kei Akagi, among many others. Presented by Nonsequitur, with support of a Neighborhood & Community Arts grant from Seattle Office of Arts & Culture.